Victory Film Group reports that the planned sneak peek for conservative bloggers of the controversial new film, The Undefeated, at Americans for Prosperity Foundation’s RightOnline Conference gained expanded interest of all the attendees coming to RightOnline. The film is scheduled to be released in theaters July 15th. Private screening have already been held for 100 people nationally including at "The Bloggers Briefing sponsored by the Heritage Foundation. A screening of the film was scheduled at RightOnline for conservative bloggers. Andrew Breitbart who is in the film and will be giving a speech at the end of the dinner gala that evening and planned to introduce The Undefeated movie. However it soon became apparent that limiting who could attend would be a problem. So Americans For Prosperity and the Film's Director agreed to relocate the film to the 1,000-seat main ballroom where it will be shown to registered RightOnline attendees at the end of the dinner being held on Friday, June 17th at 9 p.m. CDT. The Undefeated is an independently produced feature film about Alaska Governor and Vice Presidential candidate, Sarah Palin. The film's director, Stephen K. Bannon, is also be attending RightOnline and meeting with new media bloggers, radio hosts and others. Written and directed by award-winning filmmaker Stephen K. Bannon and produced by Victory Film Group co- founder Glenn Bracken Evans and Dan Fleutte, The Undefeated was independently financed by Victory Film Group and its partners. The movie features a wealth of rare and never-before-seen footage, as well as exclusive interviews with Alaska lawmakers who offer fresh perspective on Palin’s time in office. It features commentary from prominent conservatives such as Mark Levin, Andrew Breitbart and Tammy Bruce. Sarah Palin was never interviewed or participated in the making of this documentary film about her. All material containing Sarah Palin was accessed from from independent sources. 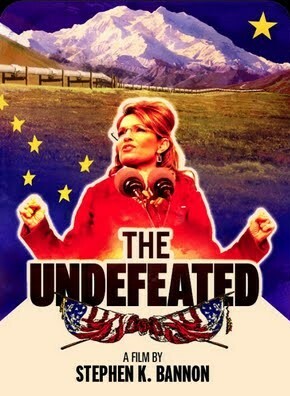 Tags: The Undefeated, Sarah Palin, documentary, movie, film, Stephen K. Bannon, Mark Levin, Andrew Breitbart, Tammy Bruce, RightOnline, 2011, Minneapolis, Minnesota, AFP, Tim Phillips, Americans For Prosperity, bloggers, conservatives, speakers, activists, To share or post to your site, click on "Post Link". Please mention / link to the ARRA News Service. Thanks!